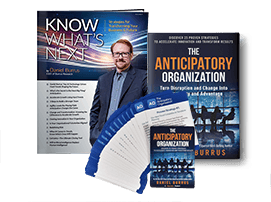 Anticipatory Leaders know the advantage a shared Futureview® has when it is based on the Hard Trends that are shaping the future – a windshield view versus a rearview mirror view. The Futureview principle states “How you view the future shapes your actions today, and your actions today will shape your future. Your Futureview will determine the future you.” Change your Futureview, and you will change your future.